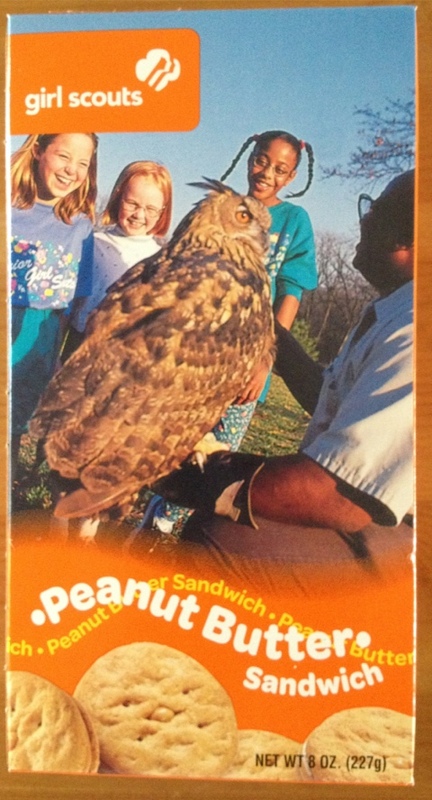 I love this Girl Scout cookie box! Who wouldn’t fall in love with birds after meeting a Eurasian Eagle Owl? I’m testing out posting with my iPhone. 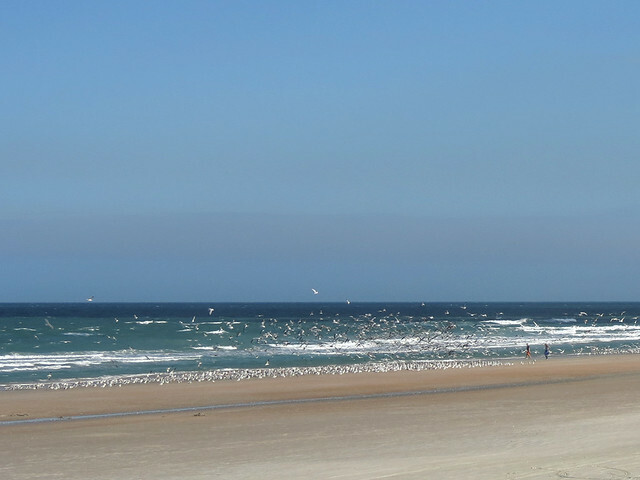 Today, 2/21, I stopped by to see the gulls at Daytona Beach Shores and witnessed an amazing sight. I saw a large group of gulls take off from along the beach and assumed that some people had chased the birds off. 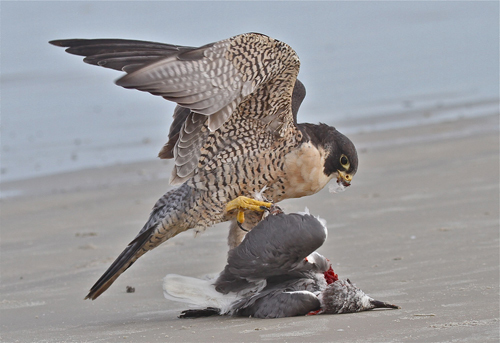 When I got closer I found an adult Peregrine had killed a Laughing Gull and it was calmly eating it right on the beach. The bird was amazingly tame and allowed me to sit only 20 feet away and photograph it for 15 minutes or more. 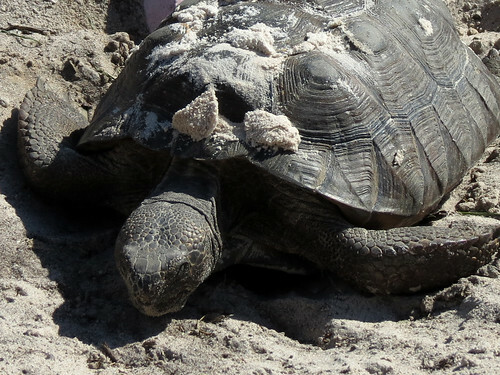 It did not seem bothered by beach walkers going by only a few feet away from it. 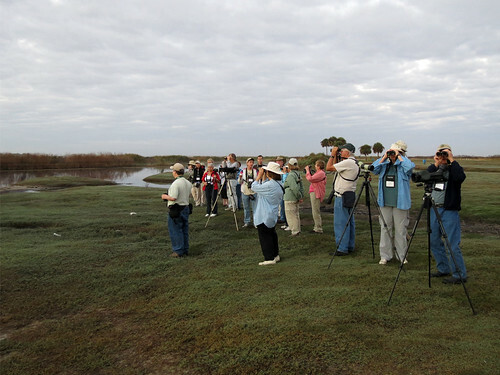 A few other birders came up and were also able to sit and watch the spectacle. Meanwhile, folks were driving by just behind us, either staring at the bird or oblivious to the rare event right beside them. Now check out the photos he captured below. You can click on them to see larger. 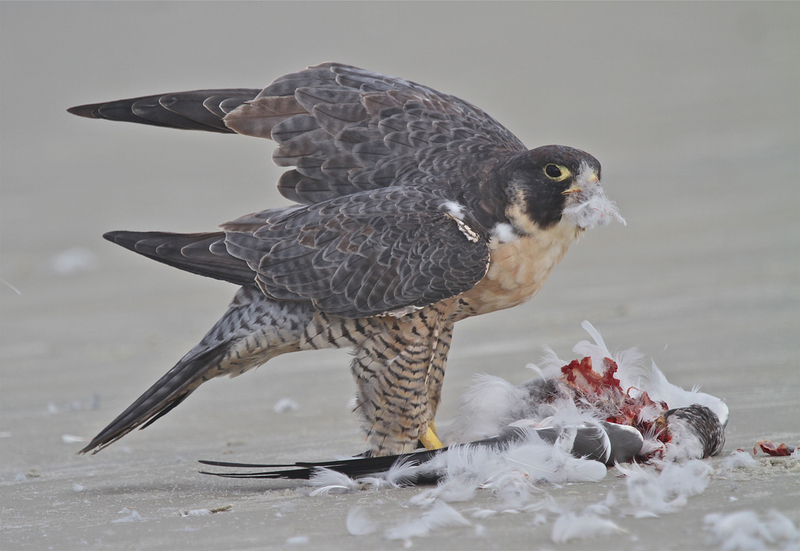 Peregrines are regularly seen hunting around the huge gathering of gulls that occurs near Frank Rendon Park in Daytona Beach Shores. Seeing one feeding right there on the beach, though? Remarkable! Thank you, Michael, for letting me post your story and photos. UPDATE: It seems I’m not the only blogger sharing Michael’s photos and story! And that’s not all – there are even more photos! If you’re not active on social media sites like Facebook, Twitter or Google+, you may be missing out on the joy of Internet memes. A meme (rhymes with cream) is “an idea, behavior, style, or usage that spreads from person to person within a culture” [Merriam Webster]. An Internet meme can be as short as a catch-phrase or as complex as a video clip. A lot of memes are simple graphics which are altered to suit different topics. 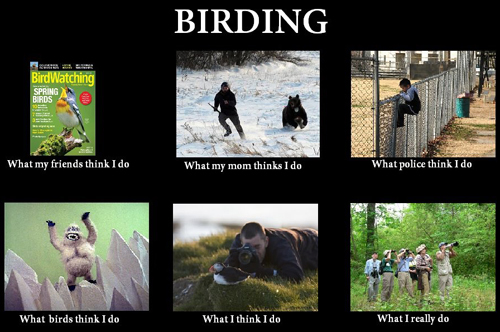 When a meme is hot, you can be sure there will be variants related to birds or birding. 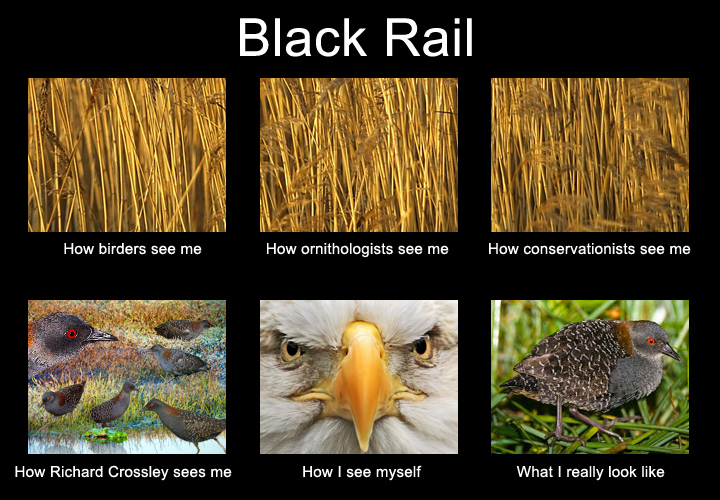 In case you don’t know, a Black Rail is a very secretive, hard-to-see bird. 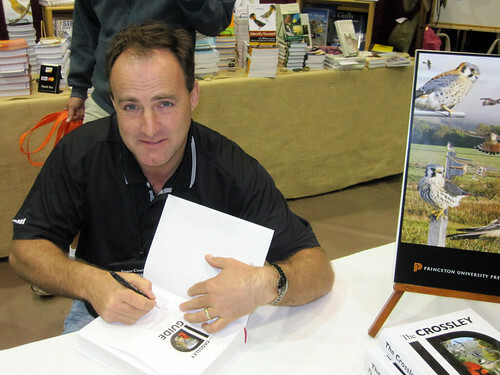 And the Richard Crossley caption refers to a rather unique photographic bird guide he published last year. Note that the Black Rail photos in this meme image were taken by photographer David Seibel. 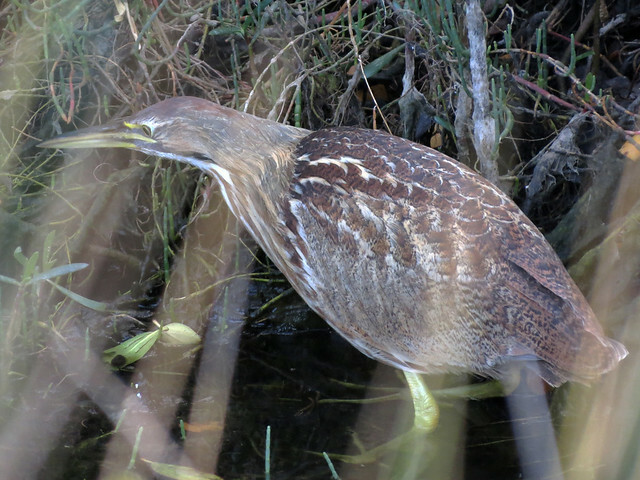 You can read about them here: Photographing the Black Rail. 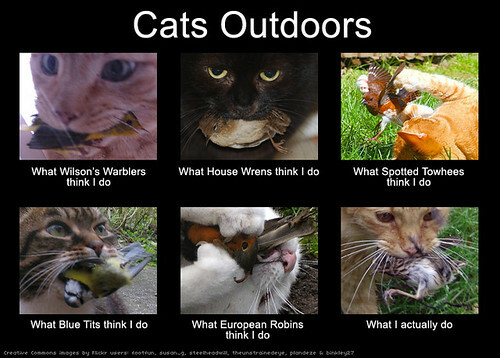 In preparing the Cats Outdoors graphic, we came across a lot of Flickr photos of cats carrying dead birds. We created a Flickr group, Keep Cats Indoors, and we invite anyone to add appropriate photos to the group. Warning: the group contains graphic photos of dead birds and dead cats. 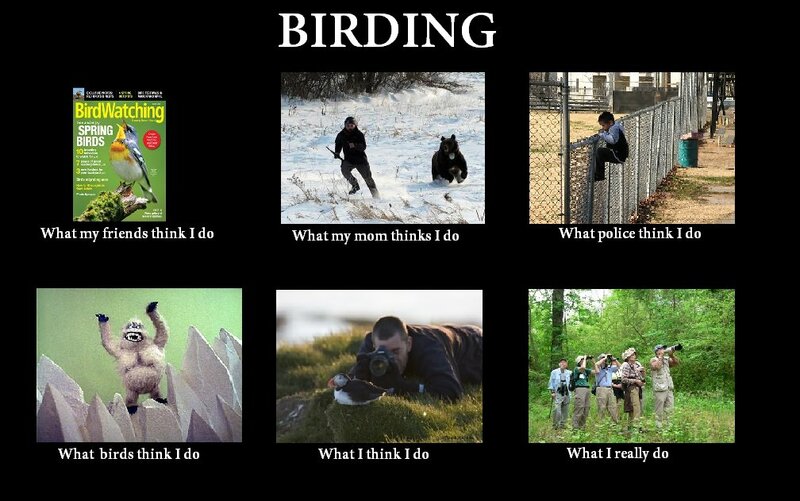 If you know of any other bird- or birder-related variations on this meme, I would love to know about them. One problem I have with the fast-paced world of Internet memes is finding them after the popularity of the meme has died down. The nature of these graphic memes means that they aren’t necessarily optimized for finding via search engines at a later date. With today’s entry of Tree Swallow in the Bird-a-Day Challenge, I’m up to 49 birds for 2012. Of the 14 birds added since my last update, five were yard birds. One of them was a doozy, though. Red-winged Blackbirds are present here in central Florida all year, but we’ve only seen them in our yard since last month. I suspect when they start breeding activities we won’t see them in the neighborhood too much. Yellow-rumped Warblers, Chipping Sparrows, and American Goldfinches are winter visitors here, and will all be gone by May or June, returning again in September or October. Goldfinches are pretty rare in our yard so I was happy to see one having a drink in our bird bath last Monday. But it was the Western Tanager that visited our yard for a brief moment last Wednesday that was a real shocker. We spotted a Western Tanager in our yard last October. Could this be the same bird? Several visits outside of the usual haunts over the last weeks provided some great birds. 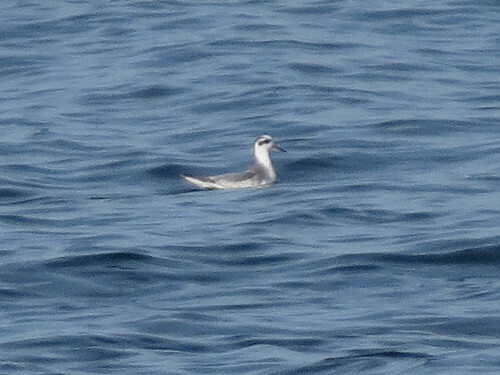 It was hard to pick the bird of the day after the Mayport pelagic trip on the 5th – I’m as likely to see a Manx Shearwater in the coming months as a Red Phalarope, I think. The Wood Ducks I saw while volunteering at the ACBOP on the 9th were my first for Florida, believe it or not. A last-minute trip to Merritt Island to see an Atlas 5 launch (which ended up scrubbed) plus two days at Disney yielded birds I don’t expect to see at home or at my local patch. A Loggerhead Shrike working the parking lot at the Orange County Convention Center was a nice surprise yesterday. On the 12th I drove to a dairy farm near DeLeon Springs to look for some reported Brewer’s Blackbirds. 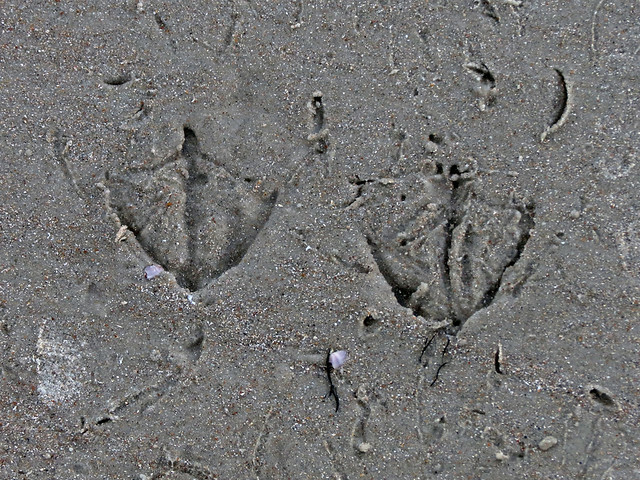 I struck out on the blackbirds but was pleased to find a nice group of Wild Turkeys, my first for Volusia for 2012. Another first for Volusia and a new BIGBY species was Green-winged Teal, a flock of which Arthur found during a morning walk at Gemini Springs on the 7th. The Nicobar Pigeon is one of the most beautiful species in the family Columbidae. 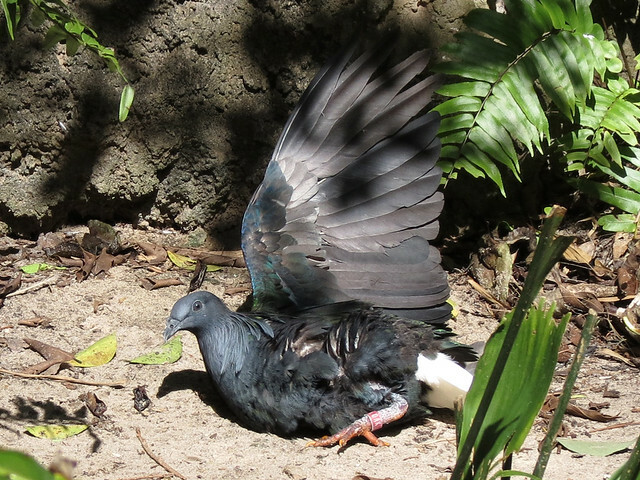 They average 1.5 to 3 inches larger than the average Rock Pigeon. And they are colorful! 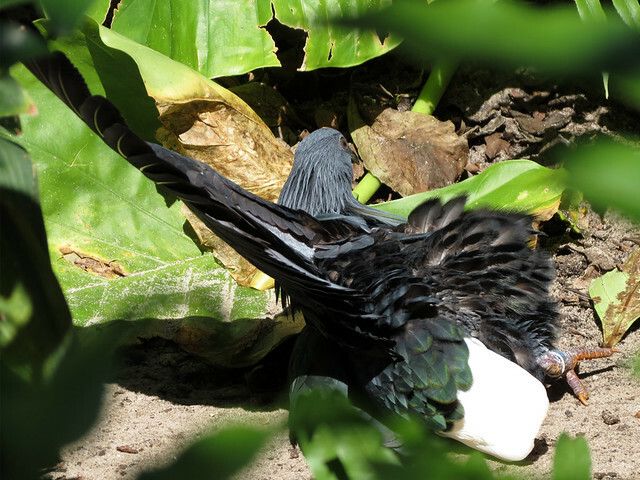 Besides their beautiful metallic green, blue and copper feathers, Nicobar Pigeons have long hackles (long feathers) around their necks. 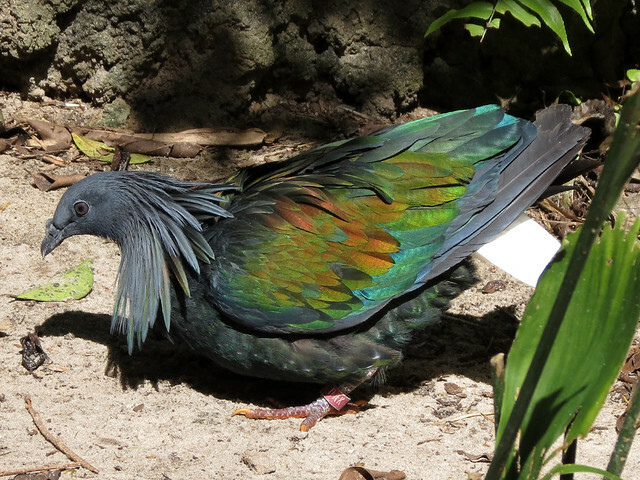 Nicobar Pigeons are named for the Nicobar Islands in the Indian Ocean. 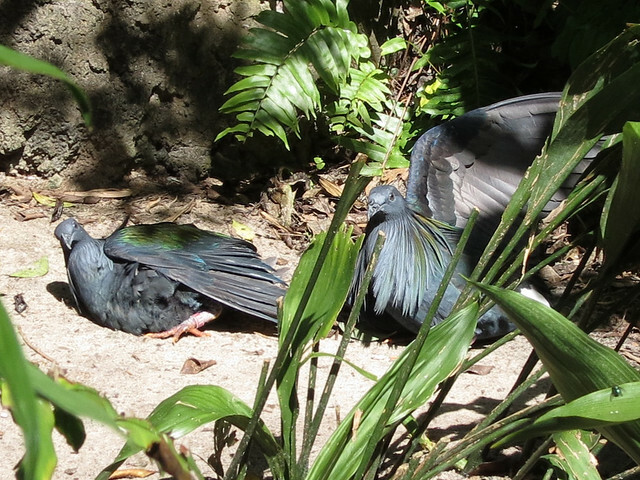 During a recent visit to Disney’s Animal Kingdom, I saw a group of these gorgeous pigeons sunning themselves. They were in a large walk-through aviary in the Maharajah Jungle Trek attraction. Throughout the park that day I noticed many new cast members being trained or following orientation from more experienced Disney employees. As I stopped to watch the sunbathing pigeons, I overheard one cast member explaining to another that the sunbathing area was a hotspot for questions from visitors who express concern for the birds. A sunbathing bird may contort into an odd-looking position, or appear to be injured, while exposing various body parts to the sun. 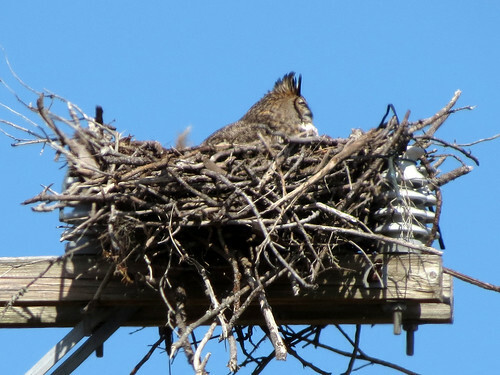 If you want to learn about avian sunbathing, this article on about.com is a good place to start: Birds Sunning. 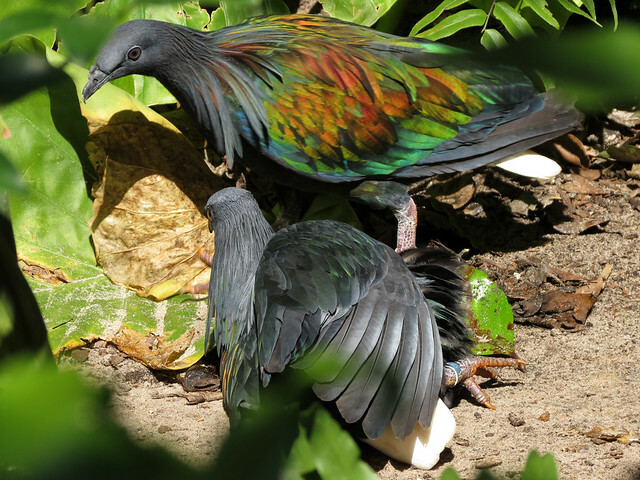 Unfortunately, the Nicobar Pigeon is considered a Near Threatened species in the wild. 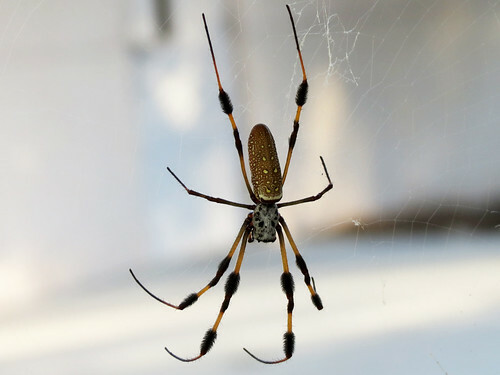 Threats to the species include hunting, the pet trade, non-native predators, and habitat destruction. 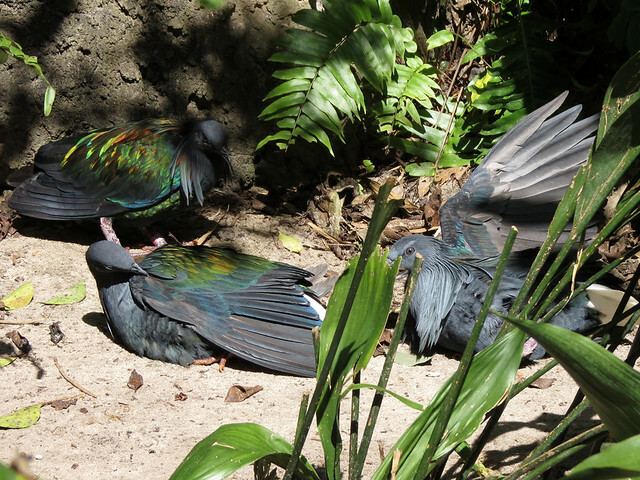 Their beautiful plumage makes Nicobar Pigeons popular birds in zoo aviaries. Because they do breed easily in captivity, breeding programs are able to stock overseas zoos. On Sunday, February 5th, Arthur and I joined 25 other birders on a last-minute pelagic trip put together by Michael Brothers of the Marine Science Center. 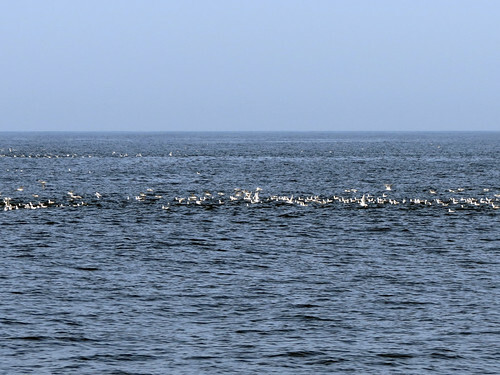 The trip was arranged after a Georgia whale survey reported seeing large numbers of Razorbills and other seabirds, along with impressive numbers of Right Whales, the week prior. The trip left out of Mayport, near Jacksonville, at about 8AM, which meant that we had to leave our home in DeBary at o’dark thirty for the 2+ hour drive north. The seas were relatively calm, the skies overcast. 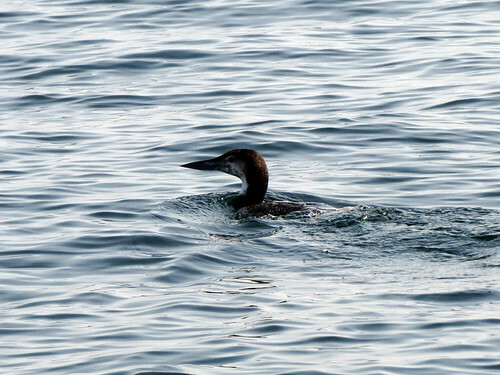 Unfortunately we didn’t manage to see any Razorbills or Right Whales at all. We did find some good birds, though. We had good looks at Red Phalaropes, and saw tons of Bonaparte’s Gulls, up to 17 Manx Shearwaters (an impressive number for a Florida pelagic), and many Common Loons, some in loose flocks on the water. 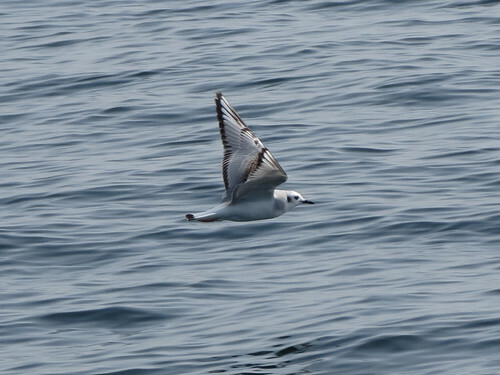 Manx Shearwater and Red Phalarope were both lifers for me. 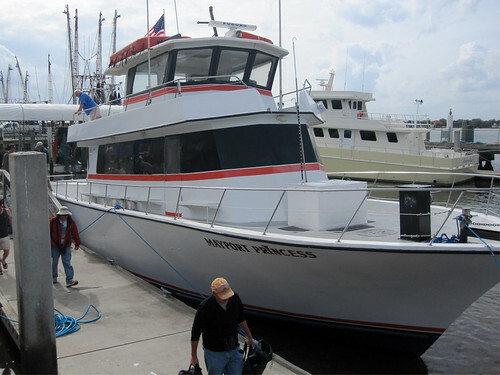 The trip was a short one; we arrived back in Mayport before 3PM. Some birders surely headed straight home to watch the Superbowl, but Arthur and I stopped at Lake Woodruff NWR for a short walk, where I was happy to hear a new year / Florida / Volusia County bird: Eastern Screech Owl. 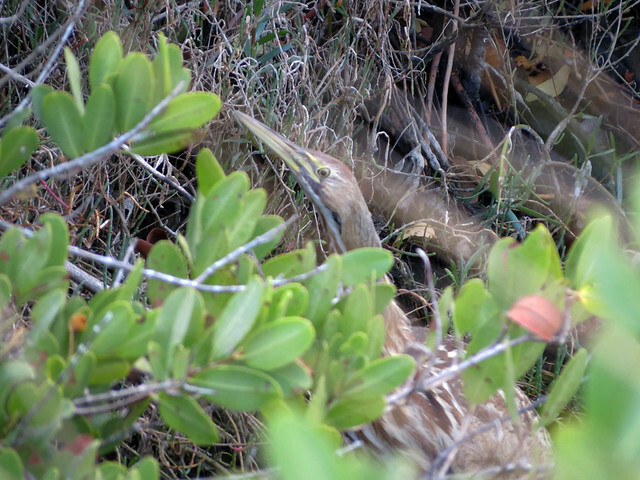 Arthur and I had a blast at the 2012 Space Coast Birding & Wildlife Festival, our first. I had wanted to attend the festival for years but we only got the chance this year, about 6 months after moving to central Florida. Since we’re semi-local, for the most part we eschewed the field trips aimed at finding Florida specialties. 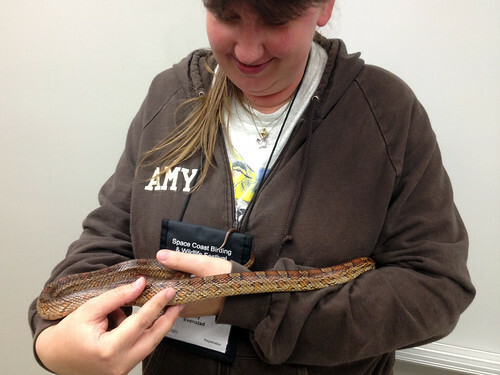 Instead we attended trips to lesser-known spots and classroom presentations focused on local wildlife with which we are still becoming acquainted. We had a great time meeting new friends (although I am disappointed that I managed to miss meeting several online friends who were at the festival) and birding the Space Coast of our new home state. Here are some random photos from the festival. I became ill shortly after the Gull Fly-in on Thursday night (NOT from the gull-watching, though!) and I continued to feel green all day Friday. 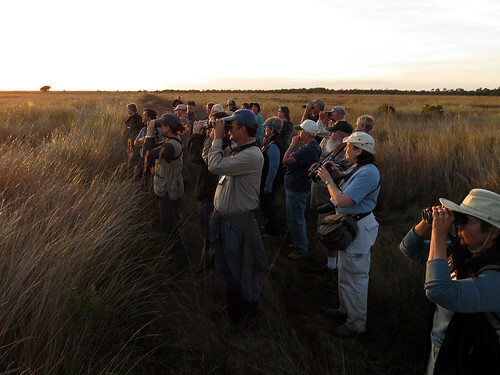 I was so incredibly sad to have to miss an entire day of the Space Coast Birding and Wildlife Festival – what a lousy time to get sick! I missed a field trip and a few classroom presentations and I was so bummed. I felt like myself again on Saturday and had a great day at the festival. And as a consolation to missing Friday, Arthur and I signed up for an extra day, Sunday. 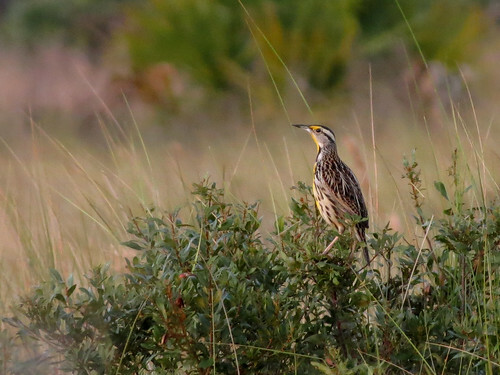 Our first presentation wasn’t until 10am Sunday morning, so we decided to make a rather mad dash to Merritt Island NWR and take a spin around Black Point Wildlife Drive. It was incredibly birdy, and it was also quite naturally crowded with birders. We had a hard time getting off the main road because of a gaper’s block right at the entrance. 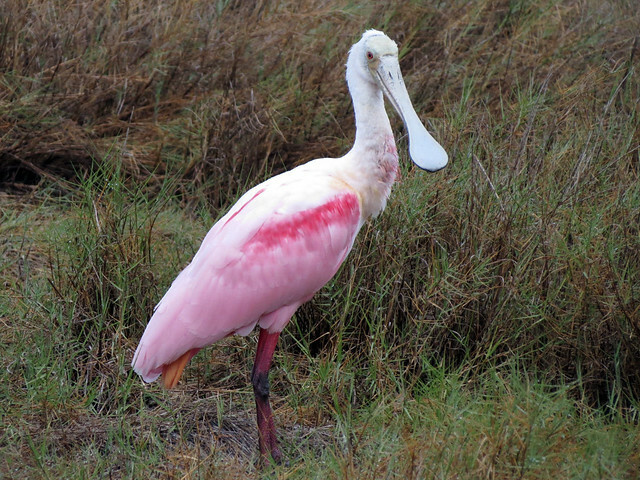 A mixed flock of White Ibis, Roseate Spoonbill, and others were delighting several cars-full of birders. We squeaked along, delighting in the delight of all the out-of-state birders gawking at Florida specialties. All along the road we came across clumps of birders standing on the road, looking at and photographing great birds. We pressed on, slow but steady. Once we crept by a pair of photographers pointing their cameras into a ditch close to the road. 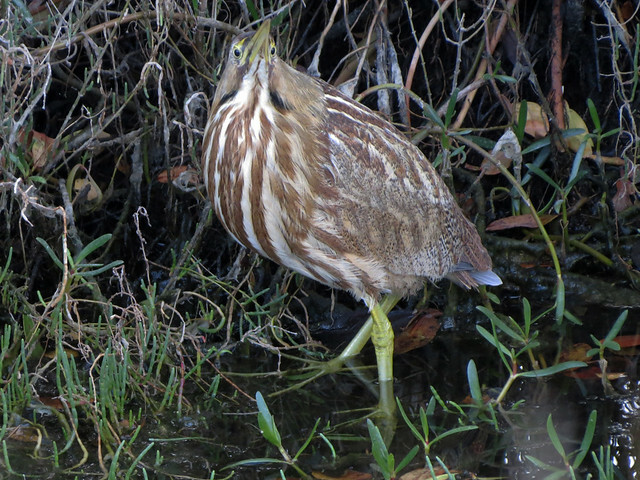 Arthur looked down as we slowly passed and whispered to me, “Bittern!” I pulled over and we carefully, quietly walked towards the photographers to get a look at the American Bittern. My first view was like this. 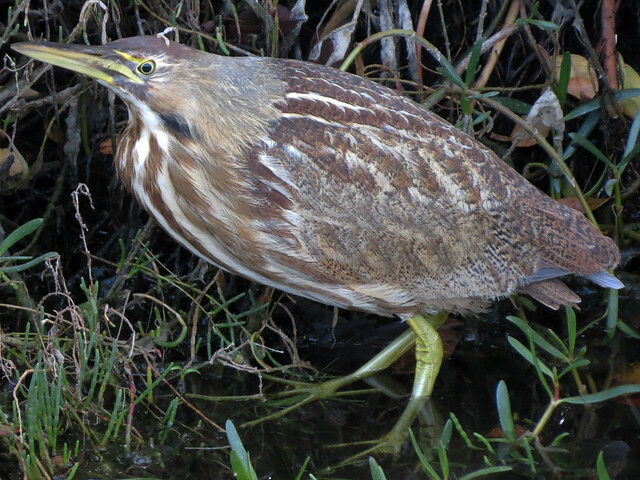 Normally I would be ecstatic to take such a photo of an American Bittern with my point-and-shoot Canon. 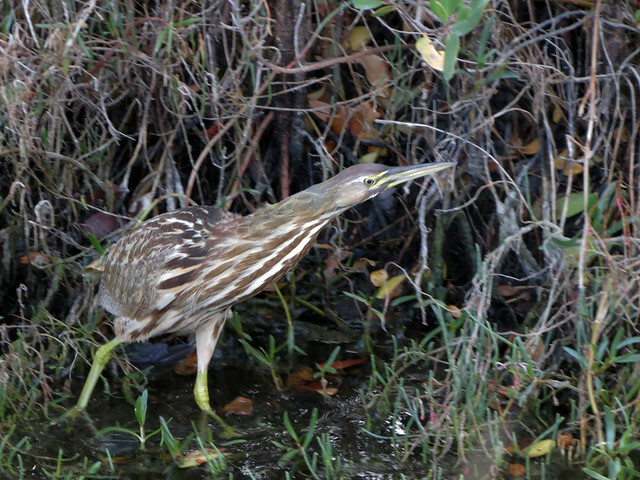 But as we watched, the bittern stepped out from behind the reeds to hunt. Check out the motion in the animated GIF below; the bird moved its entire body but the head stayed perfectly still! We watched it for perhaps five minutes before it caught a tiny snake, ate it, and then headed back into the reeds and out of view. 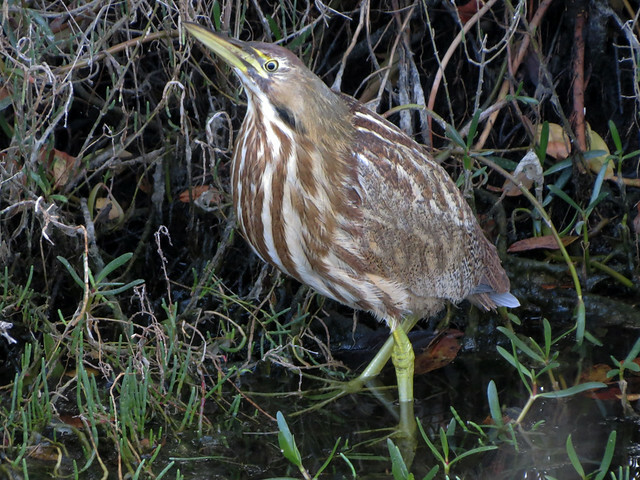 After it disappeared, one of the photographers remarked to no one in particular: “422 photos!” That’s a lot of photos of a very cooperative and beautiful American Bittern. I’m sure at least 421 of them were better than mine, but I’m thrilled with what I got anyway. I hope you like them, too. Now that I’ve made it into February in the Bird-a-Day Challenge, I thought I’d start posting semi-regular updates as the weeks roll on. Since my last update on January 25th, I’ve added 11 birds, three of which were dreaded yard birds. 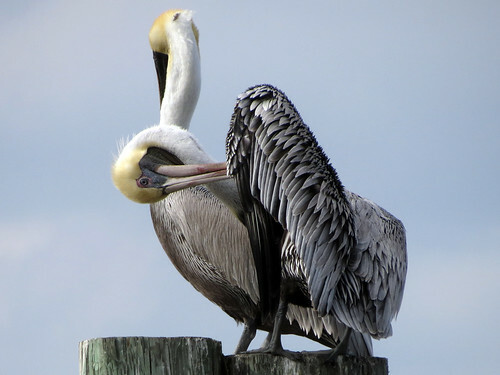 I attended the Space Coast Birding & Wildlife Festival in and around Titusville from January 25th to 29th, which meant I was seeing birds I don’t expect to see here at home and at my local patches – great birds for the challenge! The Black Rail on January 25th was one of at least three heard-only (yes, that’s legal!) birds during a festival field trip designed especially for finding these elusive little rails. Notice the yard bird there in the middle of the festival on January 27th – I was sick and spent most of the day in bed, and when I finally got to peek out the window I didn’t see anything more rare than a flock of Common Grackles. I also got to pick up a good bird on February 1st when Arthur and I took a hastily-planned trip to Kennedy Space Center (to see this) and I found a single female Bufflehead in a small pond during our tour. The rest of the birds were found locally and most are pretty common right now. The Northern Harrier was a nice surprise as I’ve only found them at Gemini Springs on two other occasions since moving here. On to week 6! 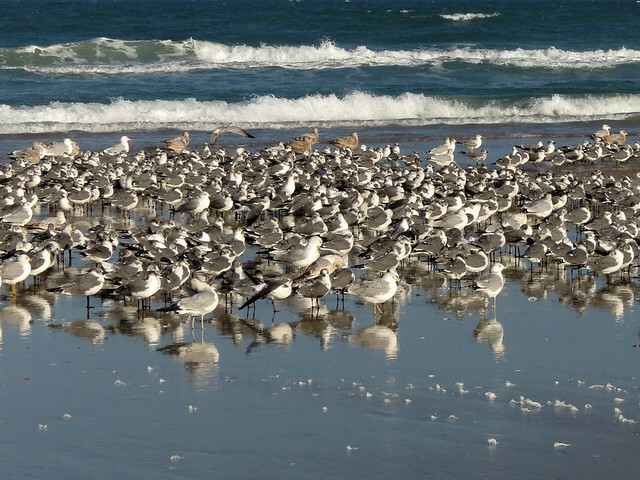 One of the largest concentrations of gulls found anywhere in the United States occurs on winter afternoons right here in Volusia County, Florida. 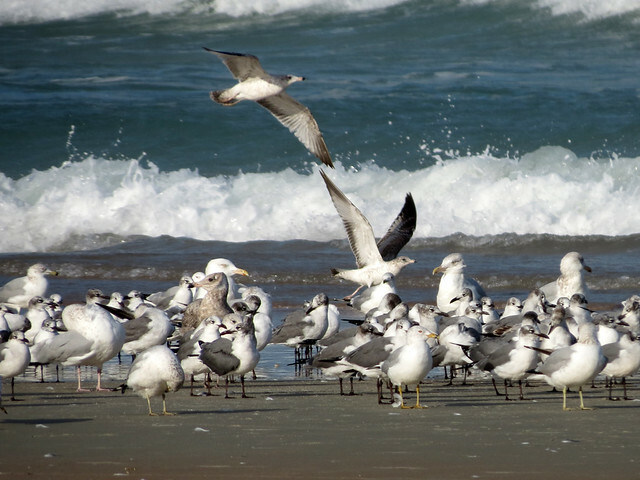 A stretch of beach in Daytona Beach Shores hosts from 30,000 up to 50,000 loafing gulls as they gather before nightfall. The gulls group together on the beach in the late afternoon before heading just offshore to spend the night. This short video clip featuring Michael Brothers of the Marine Science Center explains this unique phenomenon. While I find this huge concentration of birds amazing, I have to admit I still haven’t fully embraced the joy of identifying and ageing gulls. 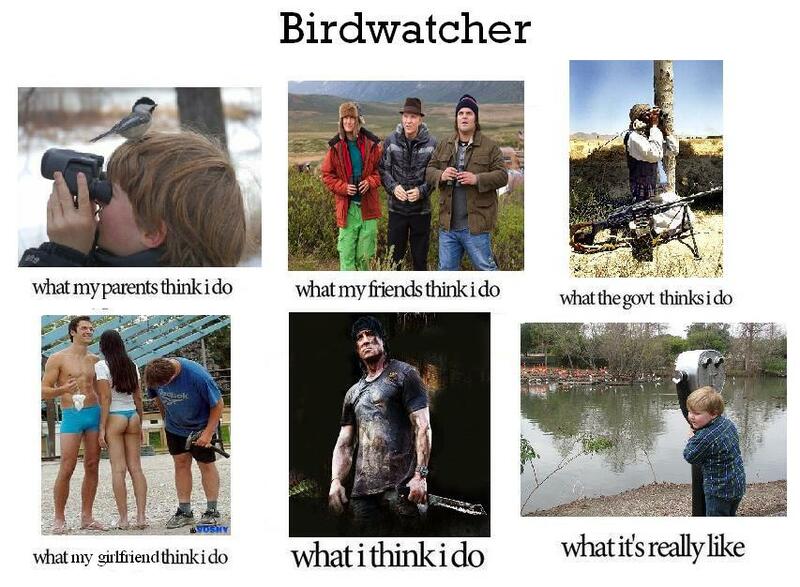 Luckily for me, there are birders that are more than up for the challenge. Even luckier, they are happy to share their knowledge with larophobes like me. 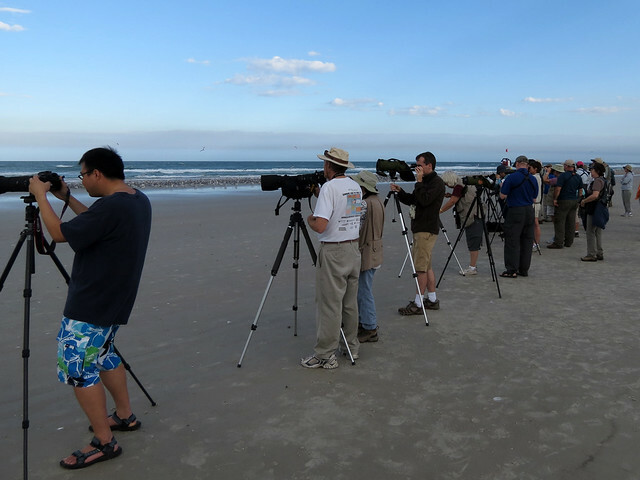 During the Space Coast Birding & Wildlife Festival, a team of larophiles, including Michael Brothers and Alvaro Jaramillo, headed the Gull Fly-in based at Frank Rendon Park. Here Arthur and I joined several other birders in happily watching the gulls flying in in huge, unbelievable, remarkable numbers. 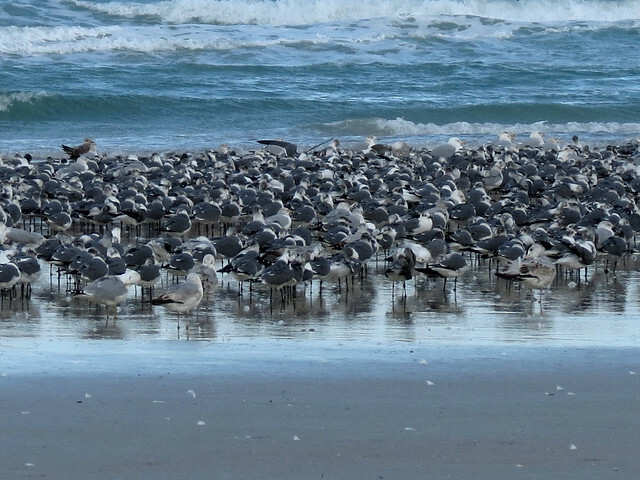 We watched them gather into gigantic flocks on the beach that must have stretched for several miles. Before the field trip began, Arthur took this video as we drove along a stretch of beach, heading to the park. This was taken at about 2:45PM, hours before the gull numbers reached their peak. 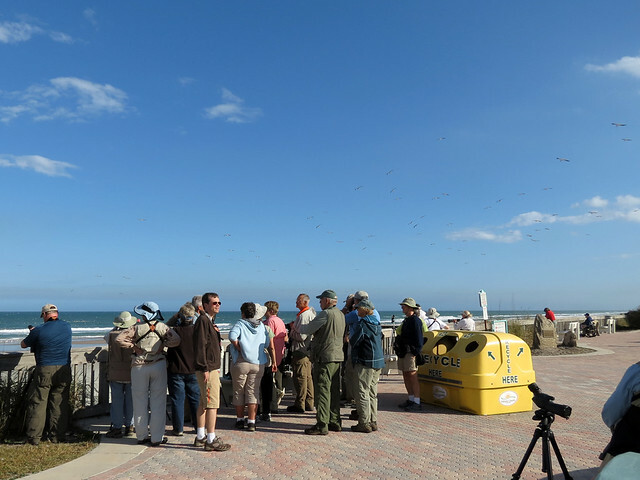 We birders gathered at the park to watch the gulls fly in before we headed down onto the beach. 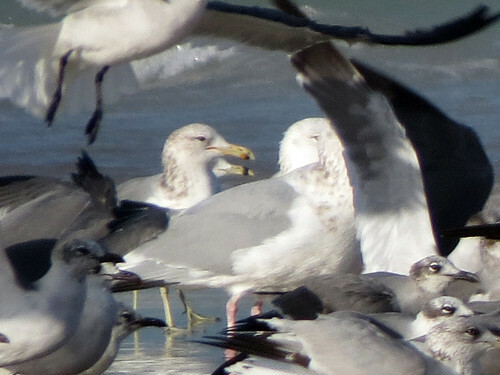 The most common gulls in the flocks were Ring-billed, Laughing, Herring, Lesser Black-backed, and Great Black-backed. 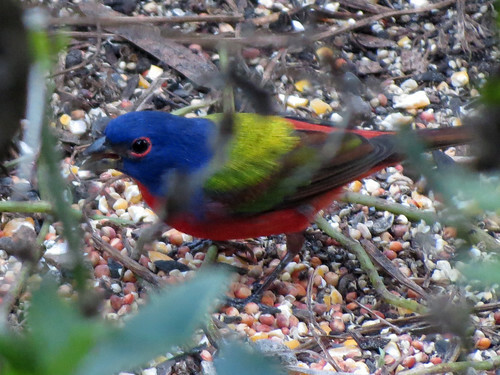 Among these species, keen eyes can pick out the birds that are different. Shortly after we stepped onto the beach, Alvaro found a California Gull. 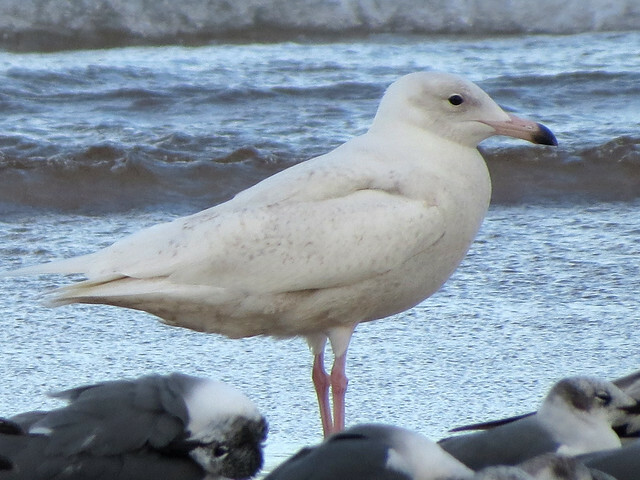 There was also a Glaucous Gull and a hybrid gull that I didn’t get a chance to see. Another highlight was watching a Pomarine Jaeger harassing gulls out on the water. 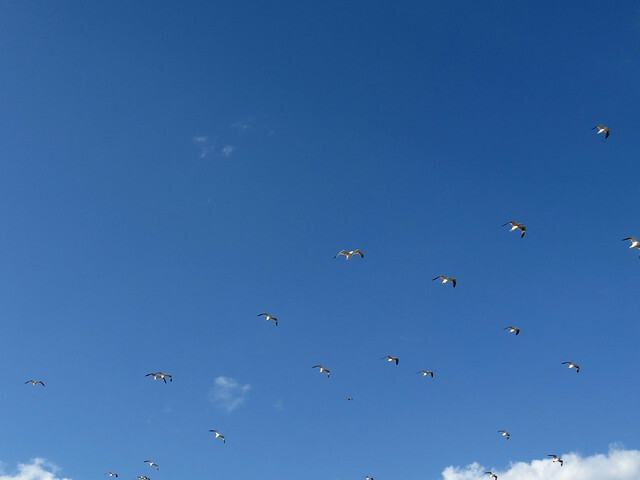 But the biggest highlight was simply seeing huge numbers of beautiful birds hanging out and doing their thing.